In this Part we will explore the meaning of the Eighth Shloka of Sri Vishnu Sahasranamam. The Lord is the Controller of all beings and things; He is a life giver and taker, one who purifies and brightens. He is the ‘life’ in lives and he is the oldest and the best. 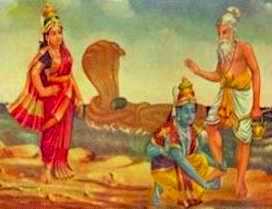 He created Brahma, the creator of the golden egg and He nurtures the Earth like a mother cares for a child in her womb. He is the consort of Lakshmi and can be attained through Mauna, Dhyaana and Yoga. He is Madhusoodanah the destroyer of the Asura Madhu. Madhu also means ‘Honey’ in the Vedas which means our Karma-phala or fruits of action. By meditating on the Lord we can get rid of the Vaasanas (desires) and hence the Lord is known as Madhusoodhanah – “The Destroyer of Vaasanas”. ‘Ishaanah’ means ‘the controller’ or ‘the ordainer’. Sri Adi Sankara says ‘Sarva bhoota niyantrutvaat Ishaanah – He controls all beings and non-beings, hence he is called the Controller’. By this Nama, Bhagavan is clearly distinguished from the bound souls, released souls, and ever-free souls. This Nama signifies that it is His innate nature to keep all things under control under all circumstances. The Nama is derived from the root ‘Is’ – to command, to control, to rule, to possess. Ishaanam is also mentioned in the Venkatesa Prapatthi’s first verse (“Ishaanam Jagatosya Venkatapate…”). It is interesting to note that Ishaanah is more commonly associated with Lord Shiva in particular to one of His 5 faces (along with Vaamadeva, Aghora, Tatpurusha and Sadyojaata). There is also a famous Vedic hymn Viz. – ‘Eeshaanas sarva vidyaanaam Eeshvaras Sarva bhootaanaam bramhaadhipatir bramhanodhipatir Bramhaa Shivo me Astu Sadaa Shivom’. ‘Praanam dadaati iti Praanadah – Giver or infuser of Life’. Being the source of all life in the Universe, Bhagavan is called Pranadah. This Nama further exemplifies Bhagavan as the Controller of the Universe as indicated in the previous Nama. Sri Parasara Bhattar indicates that the life-giving function attributed in this Nama is the act of Bhagavan to give strength to the nitya-suris or Ever-free Angels to always visualise Him, enjoy Him, and do service to Him. Sri Adi Sankara points out that in addition to the above interpretation, the same Nama can be interpreted to mean that Bhagavan is also the taker of Prana, ‘Praana- praanaan dyati iti’ – One who takes away the Praana or vital airs at the time of death, or Praanaan deepayati iti – One who purifies and brightens the vital airs. Praana is the living force or the vital air characterising a living organism. Bhagavan is verily the embodiment of that vital energy and hence is called ‘Praanah’. Because He sustains the Prani, He is Praanah. The Nama can also be understood as referring to Bhagavan being the cause of the Prana or life-impulse in the air that sustains Life. In the Keno Upanishad, the Supreme is defined as ‘Pranasya Praanah’ – ‘The Praana of Praana itself’ or ‘He is the Life of Lives’. Sri Adi Sankara says ‘Praaniti iti Praanah – one who enlivens life’. Literally this Nama means ‘older than the oldest’. Vriddha means an old person. Brahma is called Vrddha-Tara since he is older than all the other beings as he Created all others as a result of this function being entrusted to Him by Bhagavan. Bhagavan is Vrddha-tama because He Created Brahma, and thus is older than Brahma. Swami ChinmayAnanda points out that Jyeshttah is a superlative term for the word ‘Vrddha’ (Vrddha – aged; Jyayan – more aged; Jyeshttah – most aged) and means the oldest. In Adi Sankara’s words Bhagavan is ‘Vriddhatamo Jyeshttah’ – Older than the oldest. This Nama means that He is the greatest or the most glorious one. Sri Adi Sankara says ‘Prashasyatamah Shreshttah – greater than the greatest’. He also elucidates further by calling Him the power behind all powers and the Cause of all Causes. Shreshttah is the superlative of Shreyah (glorious). It is to be noted that the sequence of the three Namas above, Praana, Jyeshtta and Shreshttah is the same sequence that occurs in the Chandogya Upanishad – Praano vaava Jyeshttascha Shreshttascha. Many great sages gathered at the bank of river Saraswati to participate in the Maha Yagna organised at that time. Maharishi Bhrigu was also present there. All the great Saints and Sages could not decide that out of the Trinity Lord Vishnu, Brahma and Shiva who is pre-eminent and to whom should they offer Pradhanta (Master) of that Yagna. With the consent of all the great Saints present there, it was decided that Maharishi Bhrigu will conduct a test and decide who was pre-eminent amongst the Trinity. 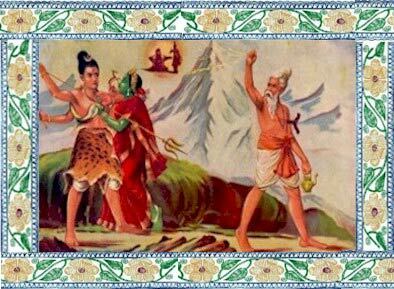 Upon being entrusted with the task Maharishi Bhrigu decided to test Lord Brahma first. He went on to see Lord Brahma in Brahmaloka. On reaching Brahmaloka Maharishi intentionally displayed utter disrespect to Lord Brahma. 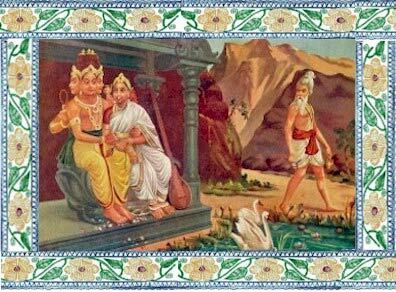 Lord Brahma got angry and wanted to punish the Maharishi but Saraswati, wife of Lord Brahma saved the Maharishi from his anger. Maharishi Bhrigu cursed Lord Brahma that no one will worship Brahma in Kaliyug out of his anger. To this day, there are very few temples devoted to Lord Brahma (the notable exception being the Temple at Pushkar). Maharishi Bhrigu then decided to visit Lord Shiva at Mount Kailash. However, upon reaching Mount Kailash, Nandi stopped him from entering the abode as at that time, Shiva and Parvati were sporting fun. Bhrigu felt slighted and cursed Lord Shiva to be only worshipped in Linga form. (We however have a statue form of Lord Shiva in Kashi (Maha Mrityunjaya Temple) said to be 400+ years ago. Then in order to test Lord Vishnu, Maharishi reached Vaikunta. 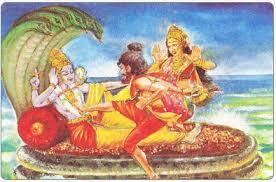 He entered Vaikunta without Lord Vishnu’s permission and saw that the Lord was resting at that time. Maharishi asked him to wake up, but Lord was in deep sleep. On seeing no reaction from Lord, Maharishi kicked Lord Vishnu on his chest (that strike by Maharishi Bhrigu left a foot print on Lord’s chest and that footprint is known as “Shri Vatsa”). Lord Vishnu got up after the strike and realised what had happened. On realizing that Maharishi had kicked him with his foot, Lord asked him, “Maharishi, are you hurt in your foot? My chest is strong but your foot is not so strong”. Vishnu apologised, seated the Maharshi on a throne and pressed the feet and removed the extra eye of the Sage in one of his soles (Sage Bhrigu was proud of that eye). Immediately the spiritual eye of Bhrigu opened and he realised his mistake and also praised Vishnu for His ‘Satvik’ qualities and declared to the assembly of the sages that Vishnu is greatest or ‘Shreshttah’. Prajaa is a subject and here it refers to all beings. Pati means a Leader. Bhagavan is called Parajaapatih because He is the natural and undisputed Leader of all beings. In the words of Sri Adi Sankara ‘Ishvaratvena sarvaasaam prajaanaam patih Prajaapatih – He is the Leader of all beings with his divinity’. Sri Parasara Bhattar gives a slightly different perspective by giving the meaning that He is the leader of those who have a glorious birth – the nitya-sooris, who are far superior to the baddha and mukhta, or the bound and freed souls. 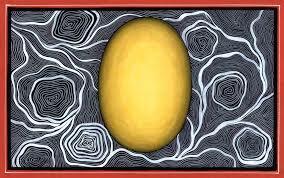 According to Sri Adi Sankara, Hiranyagarbha refers to Bramha as the Creator and dweller in the Golden Egg generating the Universe. Since Bramha is only a component of Lord Vishnu Hiranyagarbhah is a name of Bhagavan also. Rigveda says ‘Hiranyagarbhah samavartataagre – Hiranyagarbhah was there at the beginning of creation’. Sri Parasara Bhattar gives a different interpretation. He interprets Hiranya as fitting or lovely. The word garbha means womb. Sri Bhattar interprets it as the Abode or Living Place. Thus the meaning – ‘One who is in a fitting or Lovely Abode’, viz. The Parama Padam. Or, He is the garbha, or originator, of hiranyaa or gold, a term used to refer to all that is the Object of fulfillment and joy. Bhoo means the Earth. Garbha means the womb. Bhoogarbhah means one who has the Earth in his womb, that is to say one who has generated the Earth. Alternatively it could mean that he lovingly nurtures and nourishes the Earth like the mother sustains the baby in her womb. a) Mayah Dhavah Madhavah – One who is the Lord or consort of ‘Ma’ (Lakshmi). The notion here is that Bhagavan and Sri are eternally and constantly associated with each other, and are Inseparable. Her power is invincible and awe-inspiring and She is considered equal to Vishnu. She is the Supreme Being who lives in the hearts of all beings of the Universe and She is endowed with divine forms. In Sri Lakshmi Sahasranamam, She is called the Supreme Prakriti who possesses the six qualities (Shad Gunas)- Gnana, Bala, Aishvarya, Veerya, Shakti and Tejas. She is one with Him, and yet remains distinct like the moon-light of the cool-rayed moon. She is endowed with all glory and is eternal. Her Dharma is the same as that of Bhagavan. Meaning: Here, ‘Ma’ stands for Mauna, ‘dha’ stands for Dhyaana, and ‘va’ stands for Yoga. He is experienced by the seeker who has stilled his mind through mauna, dhyaana, and yoga practices. Or, it can be said that He is Madhava because He is endowed with mauna, dhyaana, and yoga – He silently observes the physical, mental, and intellectual activities of all beings, and is ever the non-interfering Observer. Meaning: “O Hari! You are the Lord Dhava of ‘Ma’ (knowledge); hence you are named Madhava, the Master of ‘Ma’”. d) Madhukule jatatvat Madhavah – One who is born in the race of Madhu, a Yadava. e) Madhavah yasya sa Madhavah – One for whom there is no other Lord. This interpretation is included as one of the explanations for this Nama by Thirukkallam Sri Nrsimha Raghavachariar in his Bhashyam on Bhagavad Gita. f) One who is the Silent Observer – this was discussed under b) above. The first 2 meanings are given by Sri Adi Sankara and the rest by the other commentators. He is called Madhusoodanah because He killed a demon called Madhu. ‘Madhu naamaanam asuram sooditavaan iti Madhusoodanah’. Meaning: “Because Sri MahaVishnu destroyed the MahaAsura by the name ‘Madhu’, He is called Madhusoodana by the Sages, Devas, Asuras and Men”. Madhu also means Karma-phala or fruits of action (Madhu = Honey). Actions leave impressions and these Vaasanaas (Desires or habits) are destroyed by meditating on the Lord and so the Lord is known as Madhusoodhanah – “The Destroyer of Vaasanas”. The Lord is Ishanah, the Controller of all beings and things. 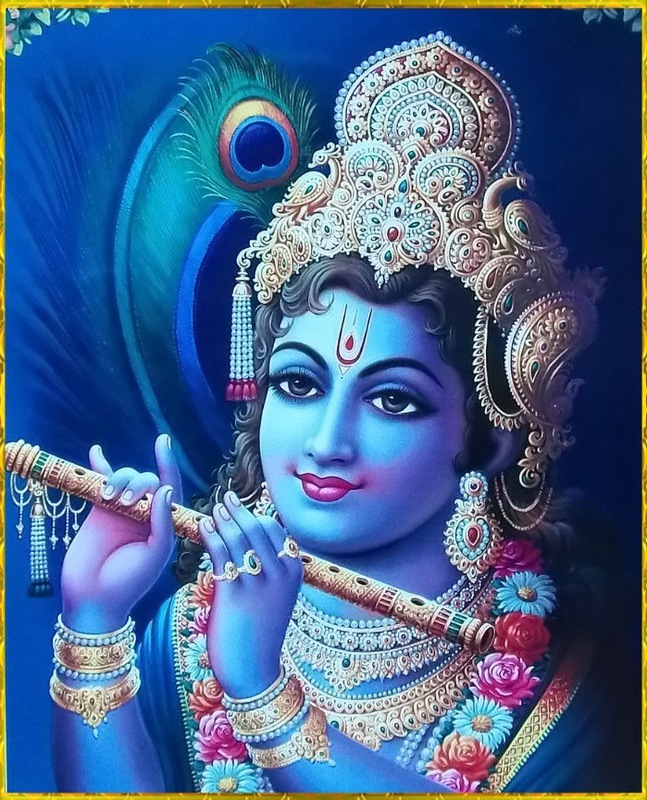 He is Praanadah, a life giver and taker, one who purifies and brightens. He is the ‘life’ in lives i.e. Praanah and He is the oldest and the best and hence He is Jyeshttah. He is glorious and the greatest and hence He is called Shreshttah. He is Prajapati as He is the undisputed Leader for all beings. He Created Brahma, the creator of the golden egg, hence He is HiranyaGarbhah and He nurtures the earth like a mother cares for a child in her womb, hence he is called Bhoogarbhah. He is the consort of Lakshmi and He can be attained through Mauna, Dhyaana and Yoga, so He is known as Madhavah. He is the destroyer of the Asura Madhu, hence called Madhusoodanah. Madhu also means ‘Honey’ which means our Karma-Phala Dhata or giver of fruits of action. By meditating on the Lord we can get rid of the Vaasanas and hence the Lord is known as Madhusoodanah – “The Destroyer of Vaasanaas”. Appreciate it for this info and for submitting! Hi Sridhar, Another extremely wonderful narration of Vishnu Sahasranamam Shloka by you. You indeed have the power to explain things in a vivid manner that a less knowledgable person like me can also understand it easily. Pranaha or the oxygen we breath is him pranadah, the source of survival is him madhava madhusoodana and what not all his names are like a treasure to my mind and I am very thankful to you Sridhar that you explained it through audio narration which indeed is a new venture, I must say your voice quality is too good and the way you explaind is very much appreciable. Thanks a lot again and expect more from you .. regards. 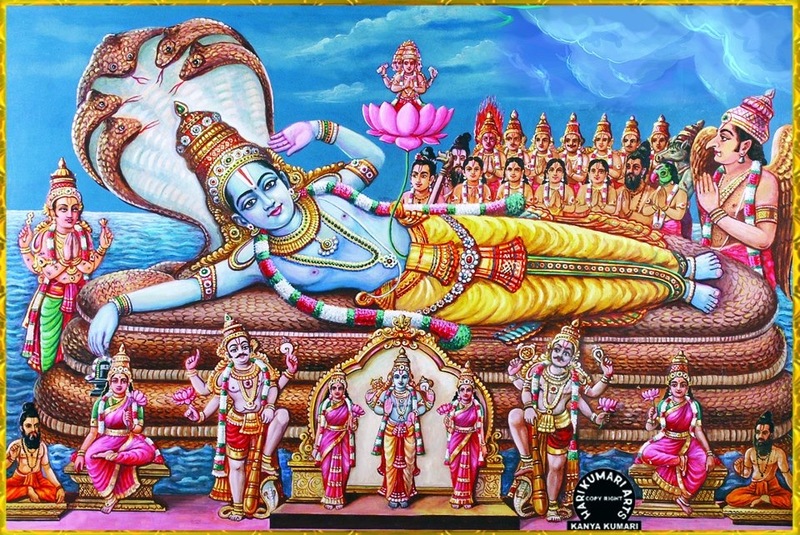 Vishnu Sahasranamam is a great Shloka and its parayanam relieves tension and stress in day to day life and brings a healthy environment at home. Vishnu Sahasranamam is recited for longevity, for good health, for overall happiness and for all auspiciousness and abundance in life. Writing a commentary on this wonderful work is indeed a commendable act. Once again very good explanations of the Lord’s name. The audio commentary will be very useful for people that find it difficult to read (though you have large fonts). We all appreciate the effort, energy and the time you take to do this for the general good of all human beings. Some of us are visual learners and others are audio learners. I especially appreciate the audio commentary as I have been trained from a very young age to listen to discourses, upanyasams, and kalakshepams. The audio commentary is clear, crisp, easy to understand and your voice inflection is ideal for following your commentary. Keep up the good work. Continue this yeoman service and Thank You!! In a classic astrological text, Sage Parashara frequently recommends the recitation of the Vishnu Sahasranama as the best remedial measure for planetary afflictions to obtain relief from evil & negative emotions. It’s evident that, “He is the Supreme Soul, there is none more superior to Him in this world, none who can control Him, and He is indeed the source of all creation, the ruler of all senses. There is none who gave birth to Him. There is none to rule over Him” He is the controller of all, the ruler of all, and the master of all. He neither grows to a higher status by performing good deeds, nor does He fall back from His predominance due to bad deeds. He is untouched by karma. He is the supreme of all entities, the ruler and nurturer of all personages & He is the imperishable Supreme Soul!!! Thank you for your complimentary and kind words.